What was your favorite book PUBLISHED in 2009? This year has sped by incredibly fast-And I didn't get enough reading done. I looked at my goodreads (become my friend!) shelf to see how many books I read this year. Looking at my lists, I wondered how many I had read that were published in 2009. So, here's a question: How many books did you read that were published in 2009? Another question: What was your favorite?? I won 3rd place in Poetry in the Oquirrh Writers Contest. Mary's Great House is giving away a Great book on her blog. Family Record Keeper looks like a great way to keep everything together! C.L. Beck is giving away a signed 2010 Greg Olson calendar! Michele Ashman Bell is giving away three great books this week. Go take a peek and leave a comment. Queen of the Clan is giving away "Missing" by Rhonda Hinrichsen. My Musical Advent Calendar blog has music and videos plus a prize. 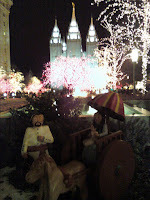 A contest everyday until Christmas on LDS Women's Book Review. You can win music at Anne Bradshaw's blog She has a rare signed DVD. Take a look! The Church of Jesus Christ of Latter-Day Saints is giving away a FREE Christmas DVD called Joy To The World. Are you a scrapbooker or crafter? There are a few blogs holding a contest to win! Racelle's Writing Spot is having an awesome give away by The Original Scrapbox. Go there NOW! Queen of the Clan and Random-ish by Nichole are also blogs for this contest. What can you write about a sleeping child? Want to win something everyday this week? Try Heather Justesen's blog. She's got books, vinyl lettering and cake! Win Baskin Robbins gift certificates on C.L. Beck's blog. What's on your nightstand? On Michele Bells' nightstand is G.G. Vandagriff's book "Hidden Branch" for you to win! Cindy Beck! You're the next winner on Taffy's Candy! Congrats on winning the 'can't put it down' book by Stephanie Black. Send me your snail mail and I'll get it to you as soon as I can. Also, Heidi Ashworth! Where's your snail mail address? I need it to send out your book.